Ivanka Trump tweeted a quote from 19th century President Abraham Lincoln following the release of Special Counsel Robert Mueller’s investigation into Russian interference in the 2016 election. ‘Truth is generally the best vindication against slander. — Abraham Lincoln,’ the first daughter tweeted Sunday afternoon. 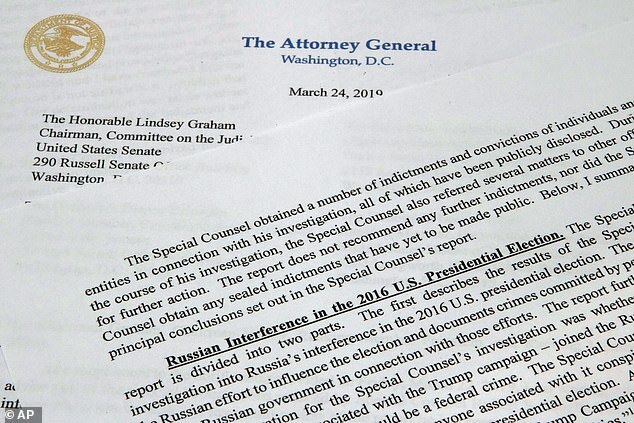 Her tweet came hours after Mueller’s report, according to the summary by US Attorney General William Barr, found no evidence that President Donald Trump’s campaign conspired with Russia in the 2016 election. Ivanka also retweeted a post that her father wrote on Sunday evening. ‘No Collusion, No Obstruction, Complete and Total EXONERATION,’ Trump wrote. Ivanka’s brother, Eric Trump, also fired off a few tweets following the release of the report. One of those tweets came in response to CNN’s Jim Acosta who tweeted an excerpt from the report. 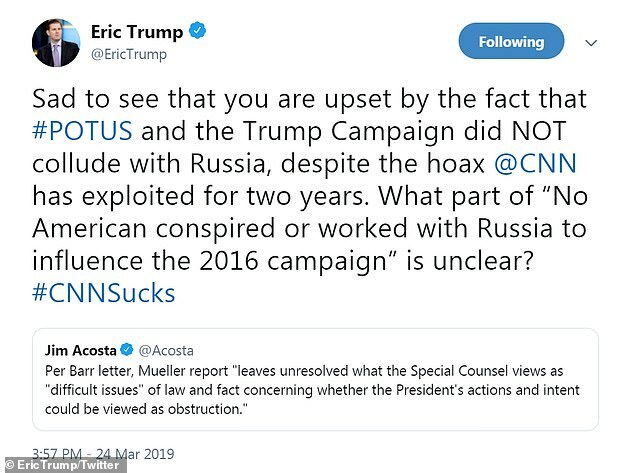 ‘Sad to see that you are upset by the fact that #POTUS and the Trump Campaign did NOT collude with Russia, despite the hoax @CNN has exploited for two years,’ Eric tweeted at Acosta. ‘What part of “No American conspired or worked with Russia to influence the 2016 campaign” is unclear?’ he continued. 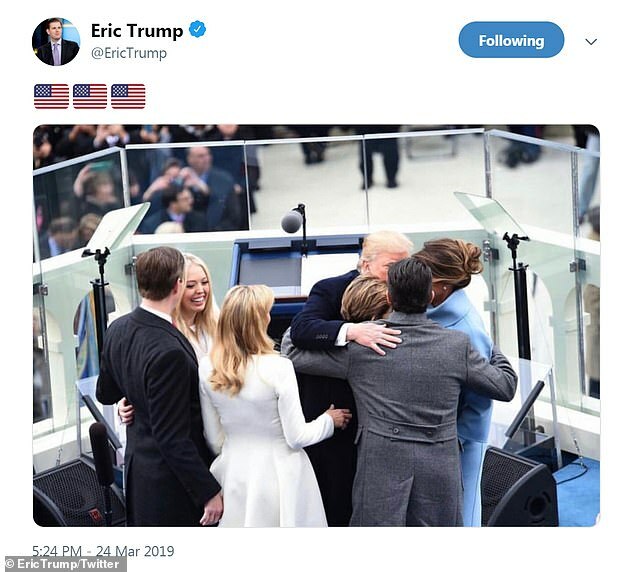 Eric also demanded an apology from several media outlets in one tweet and in another, he shared a photo of his family hugging during the president’s 2017 inauguration. 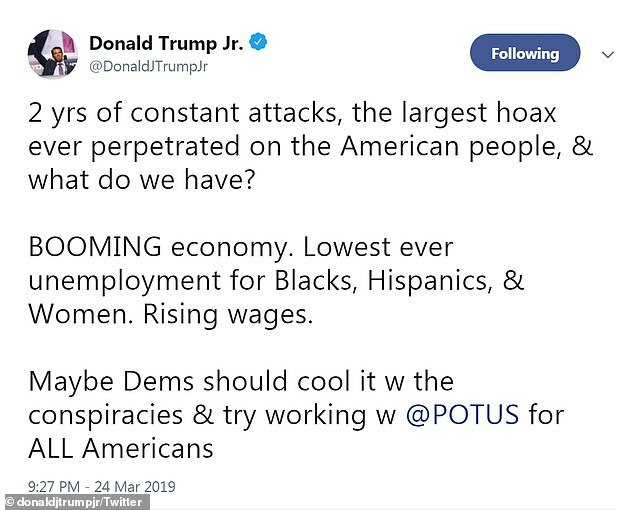 Donald Trump Jr also chimed in on Twitter saying that he ‘never thought I’d see the day where Democrats are visibly upset that the President of The United States DIDN’T collude with the Russians’. ‘Lowest ever unemployment for Blacks, Hispanics, & Women. Rising wages. Maybe Dems should cool it w the conspiracies & try working w @POTUS for ALL Americans,’ he added. 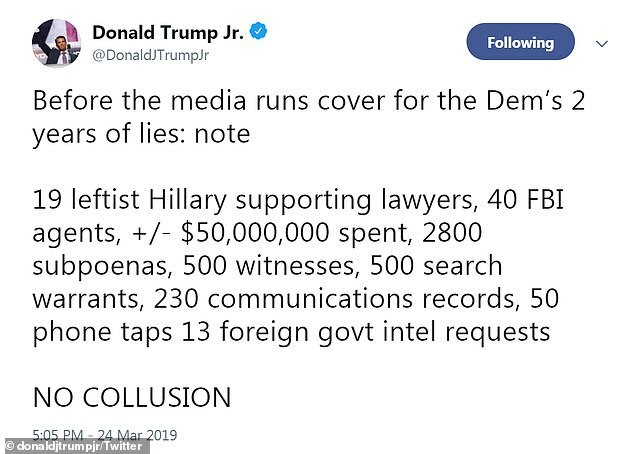 One of his most notable tweets from Sunday saw him call out leftist Hillary Clinton supporters who are angry that the report found Trump and his associates not guilty of collusion. ‘Before the media runs cover for the Dem’s 2 years of lies: note 19 leftist Hillary supporting lawyers, 40 FBI agents, +/- $50,000,000 spent, 2800 subpoenas, 500 witnesses, 500 search warrants, 230 communications records, 50 phone taps 13 foreign govt intel requests NO COLLUSION,’ Don Jr wrote. 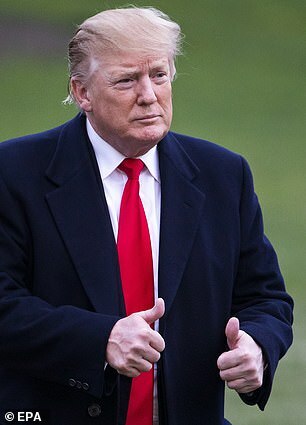 It is a major political victory for Trump, who quickly hailed the announcement as ‘complete and total exoneration’. The long-awaited report into whether Trump’s campaign colluded with Russia to help Trump defeat his Democratic opponent, Clinton, marked a major milestone of his presidency as he prepares for his 2020 re-election battle. But Democratic opponents made clear that it would not end their political assault against him. 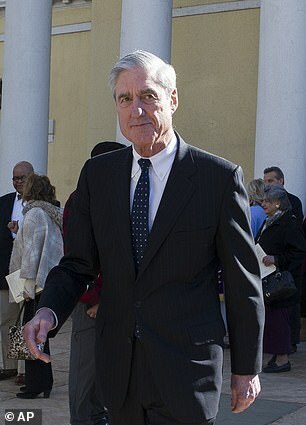 Mueller himself did not reach a conclusion on whether Trump broke the law by interfering with the various probes into the 2016 election but presented his evidence to Barr to make a determination. Many of Trump’s opponents had accused the president of obstructing the Russia probe when he fired former FBI Director James Comey. Barr and Rosenstein concluded that the evidence did not justify bringing obstruction charges, in part because there was no underlying crime. ‘While this report does not conclude that the president committed a crime, it also does not exonerate him,’ Barr quoted Mueller as writing in his report on the issue of possible obstruction of justice. US Rep Jerrold Nadler, Democratic chairman of the House Judiciary Committee, said it ‘seems like the Department of Justice is putting matters squarely in Congress’ court’. Nadler called for Barr to testify to Congress, citing ‘very concerning discrepancies and final decision making at the Justice Department’. ‘It’s a shame that our country had to go through this,’ Trump told reporters before boarding Air Force One to return to Washington from Florida. Barr’s summary said Mueller found no evidence that the Trump campaign coordinated with Russia, despite ‘multiple offers from Russian-affiliated individuals’ to help them. None of those charges; however, directly related to whether Trump’s campaign worked with Moscow.